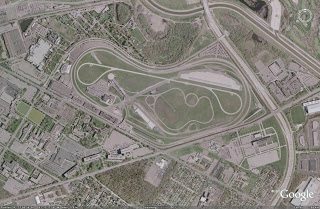 It is becoming increasingly likely that your next car is being developed at one of the most famous racetracks known to man. 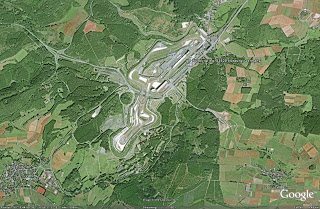 The Nurburgring (more frequently called just ‘The Ring’) lies in the Eifel mountains south of Cologne, Germany. A portion known as the Nordschleife, at 13 miles long (20.8km) is still used for relatively major races, but Formula 1 was deemed to fast for this track decades ago. What interests motor enthusiasts is this: Manufacturer’s days. Not only is this where you see those spy shots of camoflauged Audi’s tailgating camoflauged BMW’s around the terrifying Karussell. In contrast to these days are the Public days, when anybody on wheels can pay 19 Euros for a ride around The Ring in their own car, motorcycle, motorhome, or tour bus. The Ring Taxi, a frequently re-tired BMW M5, offers a seriously fast passenger ride for those who want a truer experience. Some automakers use the Nurburgring enough to make a permanent on-site garage necessary. Although once a BMW/Mercedes/Porsche/Audi bastion, The Ring is now used by every maker with a brain, which included at first the Japanese and now even General Motors. 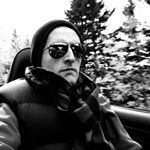 GM makes great claims on behalf of the Cadillac CTS’ and Chevrolet Corvette’s handling, and much of the credit, they say, comes down to the Nurburgring. It simulates all the road surfaces, turns, radii, and wear and tear a car will see in the run of its motoring life. Critics say that Ring testing is partially to blame for today’s rough-riding cars, especially those cars which stem from traditionally smooth-riding manufacturers. These rough-rides are part of the compromise when you seek enhanced handling, but the cause may be better traced to run-flat tires on heavier cars with the big wheels consumers demand. 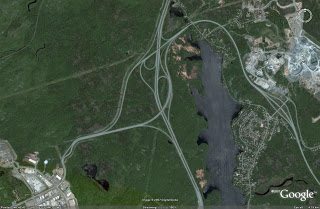 Here’s a few Google Earth images of facilities where automakers perform a huge chunk of their secret development and testing. GoodCarBadCar skipped the images of snow-covered frozen lakes in Finland and arrow-straight roads through the United Arab Emirates where much of the cold and hot weather testing is done. Fiorano is not just the surname of the Ferrari 599 GTB, it is also the host track to Ferrari’s F1 and road-car testing. Maserati would be a frequent visitor as well. 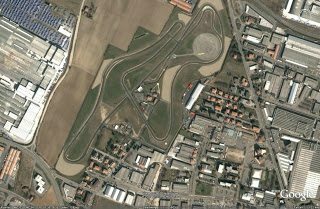 Found in Maranello, Italy up against Ferrari’s facilities, Fiorano is 35 years old. Enzo Ferrari’s house/office is nearby, just one factor leading to an aura unlike any other track you see here. 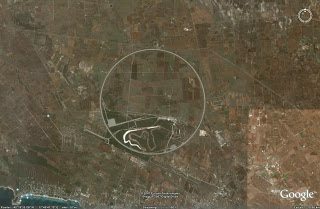 That crop circle you see in the middle of the image is the Nardo high-speed bowl. Found in the heel of Italy’s boot, Nardo’s bowl is almost 8 miles around. When speeds rise significantly, a car will eventually be free of any lateral forces. This provides hands-free driving. Mind the bumps, however. High-speed testing for multiple manufacturers is completed here in addition to record breaking top-speed attempts by automakers like Koenigsegg and Bugatti. As difficult as it is to realize that the Nardo bowl is 12.5 km long, so it is with this Volkswagen-owned facility known as Ehra-Lessien. What is actually just the name of a municipality in Lower Saxony has become a name synonymous with really crazy fast top-speed runs of cars like the Bugatti Veyron and McLaren F1. Although there are almost 100km of track available to Volkswagen, Audi, Bugatti, SEAT, Bentley, Skoda, Lamborghini…. and Porsche, the real tasty bit is the 9km straight. 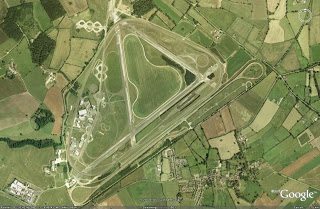 MIRA is a massive testing facility in Warwickshire, England. Click to see the larger image and you’ll see the massive network of roadways including a handling and stability circuit, steering pad, high-speed circuit, wet handling and cornering facility, corrosion test facility, resonance road, twin straights, cross-country/4×4 area, and test hills. Vauxhall is not the only user, by any stretch. The Milford Proving Grounds outside of Detroit, Michigan is home to, guess who? General Motors. Milford opened in 1924 but the operation has grown significantly, with 4820 salaried employees making use of and working directly at MPG. This GM facility was a precursor of all the massive, heavy-duty at home testing facilities to which automakers have become accustomed. You can imagine the debate in the corporate headquarters not long after WWI, not long before the Great Depression, over the cost of building and operating an area like this. 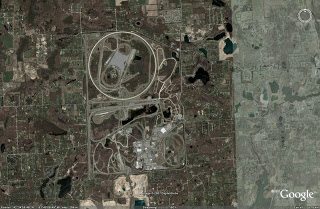 Ford Motor Company’s Dearborn home is also home to their major proving grounds now known as the Dearborn Development Center. This is but one of Ford’s many like-minded facilities. Ford also has complexes in Naples, Florida; Yucca, Arizona; Bemidji, Minnesota. 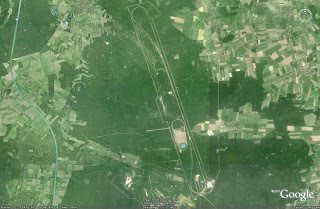 International proving grounds for Ford are located in Sao Paulo, Brazil; Cuautitlan, Mexico; You Yangs, Australia; Essex, England; Lommel, Belgium and Thompson, Manitoba. Finally, you have my personal proving grounds. What these grounds proved, I can’t say for sure. But I am an accident-free, low insurance risk and I do perform a mean mid-winter-storm parking lot drift. If you can guess where this group of nasty turns is located, email [email protected] for congratulations in your superior map-reading ability.